My pantry is an ongoing work in process. I know what I want it to look like, but I'll be saving for my custom shelving for awhile yet. Someday, it will look something like this, but with Sherwin Williams Oyster Bay instead of the bright orange. In the meantime, I've been playing around with some ideas to make the best use of its ample space. One thing I knew I wanted when we designed the pantry was an appliance shelf. I wanted my appliances stored at waist level, with easy access outlets nearby. I didn't take a great before photo, but here's the idea. 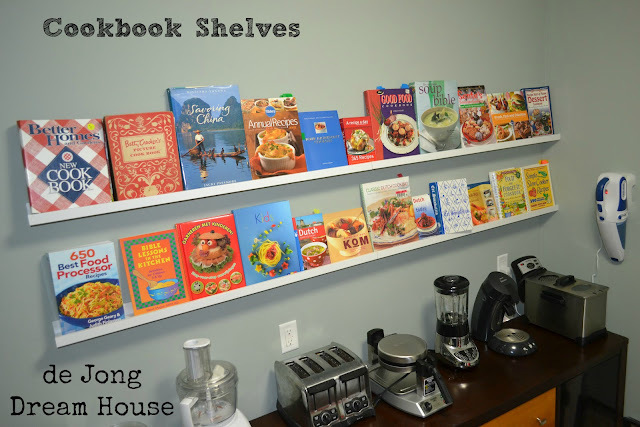 However, there are a few cookbooks I like to keep nearby, like my Dutch cookbooks and other specialty cookbooks for which recipes are a little harder to find. I didn't want them taking up space in command center, so putting them face out, library-style, serves both practical and decorative purposes. Once again, we used our favorite Ribba picture ledges from Ikea. For starters, we used two 451/4" shelves. They were easy to line up. But I picked up two more shelves the next time we were at Ikea. I absolutely love this idea! I just mentioned you in one of my posts and linked back to this idea. Thank you for the inspiration! Thank you so much for the shout out and link! I'm off to read more from you! Hi, I just bought the same shelves from Ikea, and was wondering what kind of screws do I need to put them up in my apartment? We used drywall plugs and screws from Lowe's. In an apartment building you may or may not have drywall so I can't give you any definitive advise as the wall material will vary. Just make sure that which ever screws(/plug combo) you use that you not overload the shelf.